While fifty-four Days on Market was a record low for December sold listings, the 4.1 Months Supply of Inventory was higher than December 2017’s 3.7 months and ahead of November 2018’s 3.9 months supply. Home buyers paid record amounts throughout 2018 as prices grew year-over-year in every month last year, led by June’s Median Sold Price of $258,500 – an all-time report high. Even so, December’s year-over-year increase of 2.1% was 2018’s smallest, and far lower than the 8.1 percent price growth from December 2016 to December 2017. 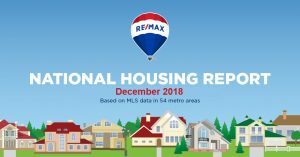 Click here to download your copy of the RE/MAX National Housing Report for December 2018. Looking to sell your Phoenix home or buy a home in Phoenix? Contact The Voss Team today! Previous Previous post: How is the Government Shutdown Impacting Home Buying? Will Low Inventory Keep You from Your Dream Home?